Foam rollers are a common sight in many settings around the world such as gyms and physical therapy / physiotherapy departments . You’ll often see people lying on them and rolling various parts of their bodies on them, often while making interesting faces. If you’re interested in how they’re used to target specific muscles and tissues, or if you’d like to know about the different types of foam rollers, this infographic is a great start. There’s much more to foam rollers and how they work and this infographic illustrates only the tip of the iceberg. Thanks to Greatist for the infographic. High intensity interval training (HIIT) is used by many athletes, both professional and amateur, as well as those training for weight loss or better health. There are many studies showing it’s effectiveness. Have you ever wondered why interval training is so effective or about different HIIT programs? This infographic may answer all of your questions about it. there are many HIIT programs including the Tabata method that only takes 4 minutes! What do you think about interval training? Do you do interval training? Please leave your comments. Running is one of the most common forms of exercise in the world. You can do it almost anywhere and need very minimal equipment. Judging by the latest barefoot or minimalist running trend, some would argue that you don’t need any equipment at all. This infographic illustrates some of the more common running injuries, how to avoid them, and how to recover from them. Some of the interesting ‘facts’ pointed out are that 36 million people run every year and that 40% to 50% of those people experience at least one injury. This is not terribly clear though. Do 40% to 50% of runners experience at least one injury per year? The infographic gives sources but no specific citations making it difficult to determine. 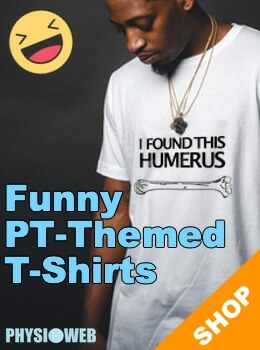 Thanks to smootherfitness.com for creating this. Most people spend a significant portion of their workday sedentary. Just because people are at work doesn’t mean they can’t get any exercise at all. This infographic shows some simple exercises that can be done while at your desk job and also describes some of the most common chronic injuries that happen as a result of a sedentary job. Common treatment options for theses chronic injuries are also discussed. Take the stairs, take the long way, and do some exercises at your desk. This inforgraphic will show you how and why. Walking has long been known to be a great activity for maintaining health. 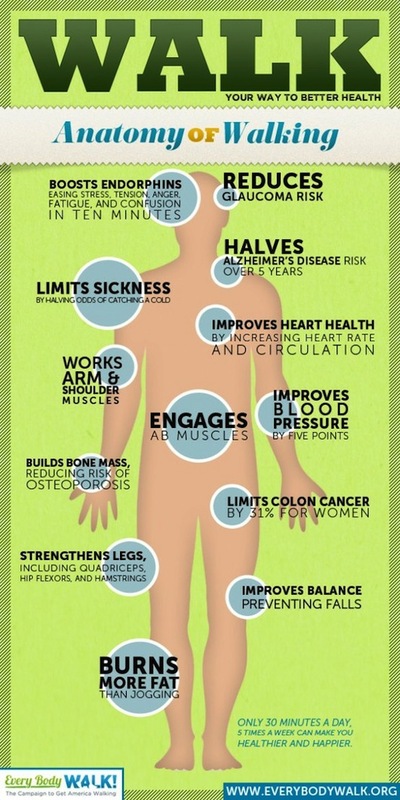 This infographic from everybodywalk.org illustrates some of the benefits that are achieved by working regular walks into your routine. Some of the benefits are obvious and well known while others may surprise you. Walk your way to better health. Please… leave us your comments at the bottom of the page. You may also be interested in: Free your feet: why running shoes may do more harm than good.